I just saw a TV new story where The Big O did the Halloween thing at the Multicolor House. Want to know what he dressed up as to scare people? The President of the United States of America. It's the time of year where all the little school kids have their parents bring the fund raisers to work, and where the coworkers all take turns buying various things from each other. One of this year's purchases was "Triple Chocolate Cookie Dough". 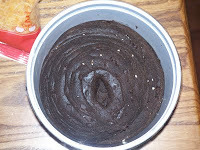 I am currently closely examining the container to make sure it isn't a product of Mike Rowe Enterprises, Inc. Daughter is baking these up tonight. If I'm not here tomorrow, send help. Jim Rawles at SurvivalBlog has been warning about this for a long time. I kept hoping that he overstating the problem, but an increasing incidence of stories like this are telling me that that hope was in vain. The house was first held up Monday night. NewsChannel 36 spoke exclusively with the Deadmon family after the first home invasion. They told us how the robbers forced them to open the safe at gunpoint. They reported the robbery to police, and they believe that's why the suspects returned. "He told my husband they had come back to kill," Sherry Deadmon said, speaking for her husband Randy, who has a disability that affects his speech. As always, I'm sure there is much more to the story, such as why this particular family was targeted. But the lesson to take away from this has two parts. Part One is that "Yes Virginia, there are monsters." Part Two is that when you encounter them, be prepared. The family had placed several shotguns around the house because of Monday's crime. "No one needs to carry a gun at home. What are you--paranoid or something?" Not yet, but I'm getting there. When police arrived at the home, they found one man shot in the garage. He was wearing black clothing, a black mask and a bulletproof vest. Ya got that last part, right? All of us had better let that one sink in deeply. These aren't unsubstantiated rumors floating about the Intertubz any longer. Yes, the bad guys are wearing body armor. They are armed, armored and deadly serious. We, the armed citizenry, need to become deadly serious as well. Time to start practicing those "failure to stop" drills, or as G. Gordon Liddy once said in another context, "Head shots! Head shots!" Don't have your concealed carry permit? Get it. Don't practice? Start. There are monsters out there, and not just on Halloween. Unclear on the concept of "employable"
Jennifer Williams apparently thinks that this fine resume, plus "I worked my way through college as a baby sitter, sandwich-maker, camp craft director and nursing-home aide" should be enough to guarantee her a nice condo with a view of Central Park. I'm reminded of the scene in "The Secret of My Success" when Michael J. Fox's character is interviewing for a job and is told he lacks experience, as he has only a college degree in business and no actual work experience. "But why did I go to college?" he asks the interviewer plaintively. "Had fun, didn't you?" Jennifer, I hope you had fun doing the MFA and Peace Corps thing. You might want to consider falling back on the "nursing home aide" experience, though, as the market for those with "theory and personal vision" is a bit...gone...these days. Remember, there's always a lot of demand for those who will do a dirty but necessary job. LawDog links us to the coolest thing on the Internet. After all the ifs, ands, buts and screw yous are counted. The House health care bill unveiled Thursday clocks in at 1,990 pages and about 400,000 words. With an estimated 10-year cost of $894 billion, that comes out to about $2.24 million per word. “(a) Outpatient Hospitals – (1) In General – Section 1833(t)(3)(C)(iv) of the Social Security Act (42 U.S.C. 1395(t)(3)(C)(iv)) is amended – (A) in the first sentence – (i) by inserting “(which is subject to the productivity adjustment described in subclause (II) of such section)” after “1886(b)(3)(B)(iii); and (ii) by inserting “(but not below 0)” after “reduced”; and (B) in the second sentence, by inserting “and which is subject, beginning with 2010 to the productivity adjustment described in section 1886(b)(3)(B)(iii)(II)”. I don't know what to think about a system that puts out gibberish like that and calls it "law". Perhaps we really do need to let the rotten edifice that the USA is rapidly becoming collapse. Maybe then we could pick up the good parts, sweep up (and out) the trash and have a fresh start. Linoge at the Walls of the City has a most excellent writeup of the new payment service, GunPal. As I expect the tools at PayPal (expect no linky love, jerks) to sue over the name, I think we all need to look into signing up and doing as many payments as possible through the service in order to let them build up a war chest of funds. Joe Huffman points out, with photographic evidence, that the left has no compunction in freely adjusting reality in an attempt to create their own truth. There was even a question? Pretty damn sad when we have to ask the DA if there's a problem with an 80 year-old man shooting a armed burglar in his own home. Those of us who blog anonymously usually have reasons. I do so because of the lesson of Kim du Toit, who found himself royally screwed in the job market because of his writing published under his real name. While Kim apparently has overcome this problem, I intend to never have it at all, so I blog anonymously. Another interesting case involves South Korean blogger Minerva, who was outted as being one Park Dae-Sung. Park had the multiple misfortunes of being quite knowledgeable in a field in which he had no formal education, blogging his thoughts, being right, and scaring the crap out of his government, with the last being his downfall. This one is worth reading for a number of other reasons, including Park's uncanny ability of reading our current economic crisis. No formal education, but self-read in many classical economics theories, a diligent researcher and his predictions were usually right, right, right. The kind of thing that would get anyone in trouble these days. Want to cause a leftist pain? Hit this poll. Make National Proletarian Radio look bad. Amen. And Thank You, to everyone. 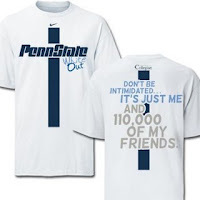 A blue, cross-like design emblazoned on T-shirts at Penn State University has some critics seeing red. Now let's see, blue and white color scheme on both, blue stripe down the center of the helmet and the shirt, reference to the approximate stadium capacity, Nike logo. Yep, all there. Those who insist on being offended by the t-shirt design...not so much. "a .25 in my pocket beat hell out of the 9mm I left sitting on my desk at home." Caleb of Gun Nuts Media was the victim of an attempted mugging. Go read how he turned the tables on the mugger. One assumes the anti-freedom crowd will tell us that this never happened, since they don't believe in the defensive use of firearms. Always remember, the little gun in your pocket beats the big gun you left at home because you were tired of dragging it around. 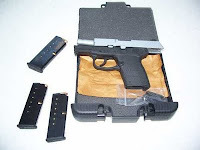 Say hello to my little friend, the Kel-Tec PF-9. Fits in a pocket; 7+1 rounds of Hydrashok goodness when you need it. How dare they make a 2% profit! Evil money-grubbing capitalists, making money off of the people's suffering. There oughtta be a law! And if Obama, Reid and Pelosi have their way, there will be. Fact be damned and reality go to hell, we must have health care reform now. Who cares if we have no health care tomorrow? The Fifth Annual Project Valour-IT fund drive is off and running. You can make a contribution kinda-sort in the name of the US Army here, or go here to pick you favorite service. Remember that Soldiers' Angels, who runs the show, doesn't play favorites among the services--the team thing is just in the nature of good-spirited inter-service competition. Project Valour-IT provides adaptive laptop computers to those who need them, regardless of their branch. ESR blogs on a creative solution to the thorny problem of non-governmental censorship. I see not only the hacker tradition of interesting and unusual thought processes at work here, but the application of something that many conservatives hate, yet libertarians seem to innately understand--that Saul Alinsky's "Rules for Radicals" works in all directions. Get out there and ridicule the Narcissist In Chief today! And you don't have to be British to see the gallows humor.